Liztek one of the top most manufacturers of electronic goods has added yet another feather in its hat, Liztek PSS-100 and PSS-60 wireless speaker. The speaker is superior to all other speakers in terms of its performance and quality. These are highly compatible and have high quality sound effects. 1. Today Liztek launches another superior quality product in the market; the PSS-a00 and the PSS-60, portable wireless speakers. 2. It is built with v3.0 technology with a wireless connectivity ranging to 33 feet. 3. High capacity speaker makes watching movies, listening to music and playing games enjoyable. 4. It comes with a hands free facility to facilitate talking and conferencing while travelling easy. 5. It is a bass enhanced device with premium sound technology, which is soothing to the ear. 6. It comes with 40 mm drivers which enhances the sound quality of the product. 7. Highly compatible with multiple electronic devices like music system, smart phone, laptop and so on. 8. These speakers can be used for long hours at a stretch almost for ten hours continuously. The speakers are built with smart technology, the design is trendy and it is available in multiple colour options like green, blue, red and yellow. The PSS-100 ns the PSS-60 are easily accessible in the market at affordable rates. The devices easy functions; and easy to operate features, makes it a hot favourite of people of all ages. 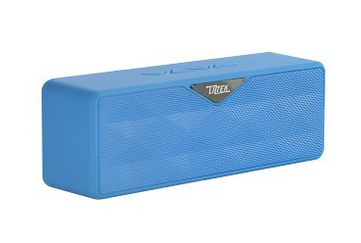 The speaker is lightweight and comes with a carry case to store it in when not in use. It is portable in nature and can be carried in handbags or even in a pocket. Bluetooth Speaker is a boon for music and movie freaks who love to listen to music and movie most of the time in a day. One can use it while studying, while working in the kitchen, use it outdoors while jogging, tracking and camping. They are hassle free and no maintenance device.